In the end of 2014, disconcerting news for chocolate lovers hit the headlines: the world could face a lack of cocoa by the year of 2020. The reports were based on a market trend analysis disclosed by Barry Callebaut, the world’s largest supplier of chocolate. But were these news accurate or an exaggeration of the media? 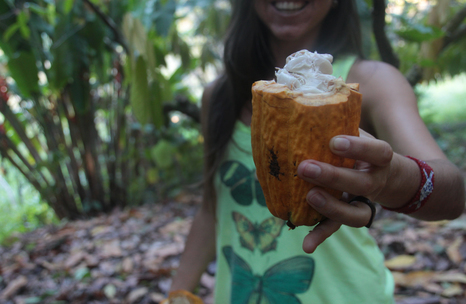 Grantees Monica Pellicia and Daniela Frechero travelled across Ecuador, Brazil and India during two months in order to investigate the future of cocoa and the many factors behind the production and consumption of the most popular sweet of the world. The result? A multimedia production with news game elements and an intriguing title - A World Without Chocolate?. Monica talked to the EJC about the findings and the behind the scenes work. A world without chocolate would be terrifying. What drove you to dig deeper into this issue and what did your project find? The idea for the project came about when Daniela and I read a lot of news related to this topic. With the purpose of better understanding the situation, we contacted Barry Callebaut’s press office and experts on cocoa. The head of the digital communication of this company told us that in fact their press release and the results on cocoa market were misinterpreted. Our preliminary investigations also showed that it was not true that the world would run out of cocoa, but there were some uncertainties in its future. We thought it was a good way to approach the future of a natural resource and the effects of the human action on it. Topics like sustainability, climate change, consumerism and ways of production therefore became central to our investigation. In the project, you explain topics related to the future of the cocoa from the point of view of three characters from three different countries. Why did you pick this approach and how did you make the selection? We wanted an immersive experience for our readers in order to allow them to really follow the story of our characters and also to give them the opportunity to travel alongside us. Considering that it is possible to find cultivations of cocoa in all the countries located near the Ecuador line, we selected Brazil, Ecuador and India as they were the more significant ones in terms of cocoa’s new tendencies for the future. The selection of the three protagonists was made based on their representativeness of the topics we wanted to discuss. For example, Glicélia is a Brazilian indigenous leader who represents the struggle of her community to gain back their lands and guarantee a sustainable cocoa production for the next generations. The farmer Servio is a good example of how Ecuador has moved in the direction of a sustainable production. 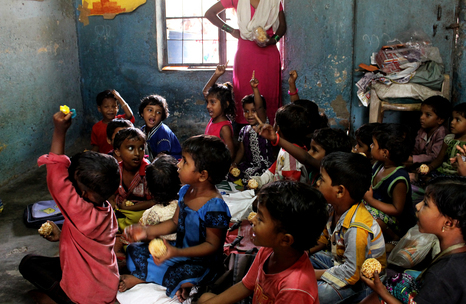 And Rekha is a young Indian professor who lives in a slum, where the chocolate consumption is expanding. Our choice of characters was also based on a gender perspective, since a research of the Global Media Monitoring Project revealed that women are represented in only 26% of the news. So we wanted to give our contribution to change that. According to your project, the appearance of the fungus Vassoura de Bruxa in the north of Brazil ended up stimulating new models of cocoa production. What has changed in the reality of local communities? The Vassoura de Bruxa is a fungus that appeared mysteriously in the late 1980s and caused the loss of 80% of cocoa plantations. It was a disaster for the country because Brazil used to be the second-largest exporter of cocoa. The interesting point is that a part of local people found a way to convert this problem into opportunities. 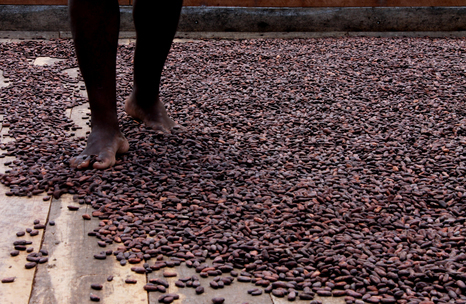 Before this crisis, the cocoa’s production chain was controlled by large estate owners. With the occurrence of the Vassoura de Bruxa, communities, indigenous people and social movements could occupy the lands abandoned by indebted owners or buy them for affordable prices. These traditionally marginalised groups were able to start their own enterprises in a sustainable way and guaranteeing the rights of the workers. This was a huge change. How about Ecuador? 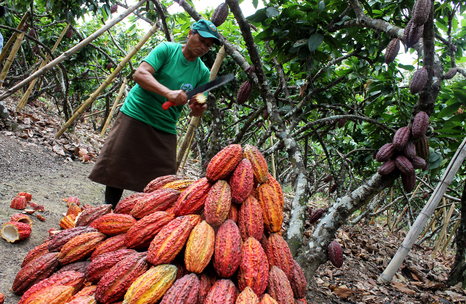 Was the cocoa production affected by the climatic phenomenon El Niño? According to the Anecacao, Ecuador’s National Cocoa Exporters Association, the El Niño could cause the loss of 40.000 tonnes of cocoa. When we went to Ecuador, everyone was talking about it, although people had different thoughts about the meteorological phenomenon. While some of them were scared and preparing for its arrival, others believed that it would not arrive at all. 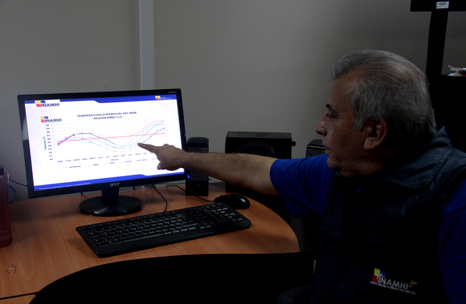 After the publication of the project, in February, we got in contact with Servio, who told us that the El Niño has not been, until this moment, as harmful as expected in most regions of Ecuador. From your story, we learned that the consumption of chocolate in India will increase by 60% in 2019. What is behind this sharp increase? There are lots of factors, considering that India is a huge market with a population of over one billion people. Firstly, a policy of selling chocolate at very low prices was implemented so that the product could arrive in almost all parts of the country. We visited three slums and in all of them it was possible to buy mini packets of chocolate in kiosks for prices affordable locally. Of course, it is still a luxury for many people, but the price brings the product closer to them. Secondly, a system of distribution was developed in order to prevent the chocolates to spoil because of the intense heat. One other aspect is related to the communication strategies used to promote the product. Throughout the country, it is possible to see posters and billboards showing Bollywood actresses eating chocolate. The same ads are on TV. In this way, chocolate starts to penetrate the Hindu culture. When navigating through the project, users can answer questions about the production and consumption of cocoa. They can also compare big amounts of data with simple and familiar facts. What do these storytelling technique add to the user’s experience? We decided to use newsgaming elements in order to allow users to have an immersive experience but also to interact with the piece in an entertaining way. We thought that newsgaming elements can turn a journalistic piece into an engaging experience. It adds an extra something to the format and allows the audience to interact with the content in a more profound way. As far as data is concerned, sometimes when big numbers are involved it is difficult to assimilate or picture what they really represent. Because of that, Isacco, our graphic designer, proposed the idea of the visual metaphor. We really liked it as it enables the reader to visualise and touch the data. It brings the data closer to the reader and it is much easier to understand for example how much chocolate was consumed in India during 2015 if you can imagine that it is the weight of 30.000 elephants! Did you face any challenges during the fieldwork? We have travelled through Ecuador, Brazil and India for about two months non-stop. It was a great experience to us since we met a lot of people, but at the same time it was tiring too. One challenge was to recognise the best protagonist among all the interesting people that we met. Sometimes we came across really interesting stories, but they did not fit our current project, so we had to save them for another moment. Once we were travelling, we also had to adapt to the pace of work of the countries because each of them has different social conventions. To make an appointment in Brazil does not mean the same thing as in India or Ecuador, for instance. It is interesting how different it is to work in each place. A world without chocolate was released by five media outlets, Al Jazeera, El Periódico de Catalunya, La Repubblica, IPS and Tages-Anzeiger. As freelance journalists, was it difficult to sell to newsrooms a multimedia product? What advice would you give to future grantees? Our idea was to spread the project as much as possible, so we used different strategies. We tried to find contacts with the support of the European Journalism Centre and other grantees, which was really helpful. Afterwards we proposed our work to a lot of journals. An essential step in this process is to find the correct contacts. Do not get scared of being insistent, since the newsrooms are very busy and they receive many emails every day. I think this is an opinion that almost every freelancer journalist shares. Another important tip is to offer different formats to the media outlets because they may not want to release a specific format. For example, with IPS we published three articles, while with La Repubblica we published a special web version and with Al Jazeera and El Periódico de Catalunya, the web doc. A last advice is to try to relate your project to the actuality, for example ours was connected to the El Niño. You need to be able to explain to the newsrooms why your project is relevant and why they should choose it. Was it difficult to time the publications taking into account your project was linked to El Niño? The El Niño was a double-sided factor. It was a subject of the actuality, which raised interest about it, but also required that the project was published in time. It could not be published in two months or in one year; it had to be published in that moment. Every two days we were checking about the progression of El Niño in Ecuador. For this reason, we had to be very insistent with media outlets. What impact do you expect to achieve with ‘A World Without Chocolate?’ Project? Our objective is to raise awareness about the human effects on cocoa, a natural resource like many others. As consumers, it is important to be aware of what is behind the products that we are consuming, such as the impact of the production mode on climate change, sustainability and working conditions. We received feedbacks from educational institutions and a website contacted us to use our data for a research about cocoa. Besides, an Australian school got in contact because they would love to give donations to Rekha’s school. For us it is a satisfaction to give voice to these stories. An interview by Sarita Reed, intern at the European Journalism Centre. Sarita graduated in journalism at UFRGS, in Brazil, and is currently a Master student in Media Culture at Maastricht University.